The Seahawks are 4-4 at the season's midway point. Bob Condotta dishes out grades and midseason awards as Seattle preps for an all-important NFC West tilt agains the Rams on Sunday. By one measure — the weekly Las Vegas point spreads — the Seahawks ended the first half of the season right where they were expected. Seattle was favored in four games (winning three of those four) and underdogs in four (winning one of those four), ending the first half at, well, 4-4. But that wasn’t what Pete Carroll expected, and it’s put the Seahawks in a precarious spot to accomplish what is always their goal — making the playoffs. Seattle is 3.5 games behind the Rams in the NFC West heading into their last meeting with LA Sunday at the Los Angeles Memorial Coliseum. And Seattle is also eighth in the NFC playoff picture this week, generally given a 30-35 percent chance to make the postseason by the various analytic sites that present weekly odds. Those might be better numbers than some predicted in the summer, given Seattle’s offseason personnel overhaul. But Carroll has never wavered that the team’s goals haven’t changed, and he didn’t this week when asked if being 4-4 was at least better than some of the more dire predictions. Before putting a bow on the first half, here’s a quick review, handing out a few awards, looking at a few key numbers, and giving out some grades. MVP OF THE FIRST HALF: RB Chris Carson. Okay, so maybe I should say Russell Wilson since a QB is basically always the most pivotal player on any team and Wilson may be even more so given his veteran status and the way the Seahawks play. Despite the Chargers faceplant, Wilson has played well overall in the first half — he’s on pace for a career-high 36 touchdown passes and what would be his second-highest passer rating. Also, one can argue that rushing numbers are less cause and effect than the other way around — that teams run well when they are already winning than vice versa. But the reality is that when Carson has been running it well and healthy this season the Seahawks have thrived. In what are Seattle’s four best performances of the season — the double-digit wins over Dallas, Oakland and Detroit and the close-shave loss to the Rams — Carson has 382 yards. In the other three in which he played he has 105 (he didn’t play against Arizona). You can argue whether they win because Carson runs well or if Carson runs well because they are already winning. But offensively, the stats show his production has been the key to the season so far. ROOKIE OF FIRST HALF: Punter Michael Dickson. Tre Flowers (more on him in a minute) is a close second. But Dickson has so far had the impact the team hoped in creating long fields for opponents. According to Football Outsiders, Seattle opponents have an average drive start this season of 25.49, fourth-worst in the NFL (or fourth-best from Seattle’s standpoint). Not all of that is due to punting, but a lot of it is. That compares to 28.75 last year, 28th. NON-ROOKIE NEWCOMER OF THE FIRST HALF: OL D.J. Fluker. Fluker was signed to a one-year deal worth $1.5 million and relatively minimal expectations given his overall NFL tenure to date. 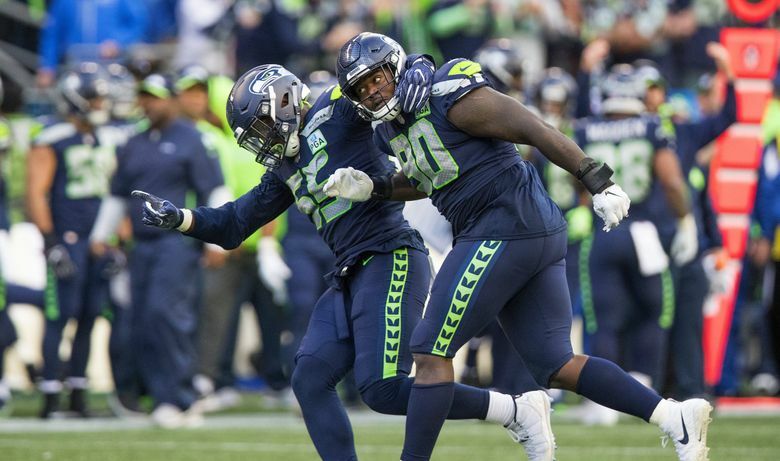 But his emergence into the lineup in Week 3 led to the revival of the Seattle running game with Fluker adding an element of fun to the locker room and toughness to the field that had been missing. Now to keep him healthy for the second half. SURPRISE STAR OF FIRST HALF: CB Tre Flowers. True, the most recent memory of Flowers may be some of those growing pains Carroll talked about showing up in the Chargers’ game. But the big picture is that few expected a rookie fifth-round pick who was a safety in college to become a starter, and in general a pretty good one, this season. Some really interesting tests the next two games against the Rams and Packers, though, to see how he responds. DISAPPOINTMENT OF FIRST HALF: The lack of progress of RB Rashaad Penny/DE Rasheem Green. While the mid-to-late rounds of Seattle’s 2018 draft look good, the top two picks have been more problematic, especially considering each had every opportunity to become significant contributors after promising preseasons, and with the expectation that they could be key players at positions of need. Penny has just 146 yards on 35 carries and last week was removed as the kickoff returner for Tyler Lockett again inserted into that spot. Green, meanwhile, suffered a high ankle sprain in the third game and has four tackles this year without a sack or quarterback hit. Carroll’s Seattle teams, though, have thrived by getting breakout play from rookies in the second half of seasons. The hope is that can happen again with Penny — whose role could grow if Carson continues to battle nagging injury — and Green. PLAY OF FIRST HALF: Dickson’s “fake punt’’ against Detroit. Seattle is 5-7 on fourth downs this season, seventh in the NFL, but 1-1 when their punter ignores orders to step out of the end zone for a safety and instead runs for a first down. KEY STAT OF FIRST HALF: 1-2. That’s Seattle’s home record, continuing a surprising recent CenturyLink Field drought. Seattle is just 2-6 in its last eight home games dating back to October 2017, with one of the wins coming against the eventual Super Bowl champion Eagles. One reason for the record, though, may be quality of competition — four of the losses are to the Rams (twice), Falcons (coming off a Super Bowl appearance) and Chargers (now 6-2 this season). And sadly, the record may be evidence of Seattle’s new uncomfortable place in the NFL hierarchy as much as anything else. KEY QUESTION HEADING INTO SECOND HALF: Can the running game revival continue and lead Seattle to the playoffs? The most pleasant surprise of the first half has been the re-emergence of the running game — Seattle is averaging 134.1 yards per game, third in the NFL. Seattle, though, ranks 15th in yards per carry at 4.3 and was held to 3.4 and 2.9 by the Bears and Dallas, the only two rushing defenses it has played that rank in the top 15, indicating the jury is still somewhat out about how good it really is. And now Seattle has to worry a little about Carson’s long-term availability. PLAYER WHO NEEDS TO STEP UP IN SECOND HALF: DE Dion Jordan. That the Seahawks know they need their pass rush to get better was evident in their acknowledged pursuit this week of former Seattle first-round pick Bruce Irvin. But with no reinforcements coming, Seattle simply needs better play from some of its young players on hand, notably Jordan, who has battled hip and knee injuries in the first half but is healthy enough now (even if remaining limited in practice most weeks). Jordan has no sacks this season in six games for a Seattle team that has 21, tied for 19th. Maybe that seems too high for a team that ranks 26th in the NFL in total yards at 339.9. But more telling is that Seattle is averaging 23.5 points per game, 17th, and 25.75 the last four. And Carroll’s vow to return to a more ground-based offense means the total yardage numbers don’t figure to wow anyone most weeks. But the way Seattle used the run to set up explosive passing plays in wins over Dallas, the Raiders and Lions is the template for what Carroll wants. And there’s enough evidence of it working to give the offense a passing grade so far. But some tough tests await in the second half. As the first half of the Chargers’ game showed, Seattle hasn’t made a totally successful transition from the Legion of Boom era just yet. But in general the defense has played better than many prognosticators figured, ranking seventh overall at 333.3 per game and fifth in points allowed (19.5). And the way the young secondary has played has only burnished Carroll’s credentials for coaching up defensive backs. The Dickson-led punting has been an upgrade from last season. And despite a few key misses, Sebastian Janikowski has also been just reliable enough (recall the game-winner at Arizona) to also be an upgrade from last season. Seattle has also generally been OK in coverage ranking in the top 12 in fewest return yards allowed in both punts and kickoffs. But the returns need to be better — Seattle is 22nd in kickoff returns and 23rd in punts.